March, 14th 2018 Version 2.9: A couple of years I had not been back to this project. July, 15th 2013 Version 2.8: Major improvements. Execution contexts and faster python transformation tools. Dec, 9th 2011 Version 2.7: You guys start contributing and that's GREAT! (The main location of the project remains this page). May, 17th 2006 Very first beta release. Refer to the history section for all changes. 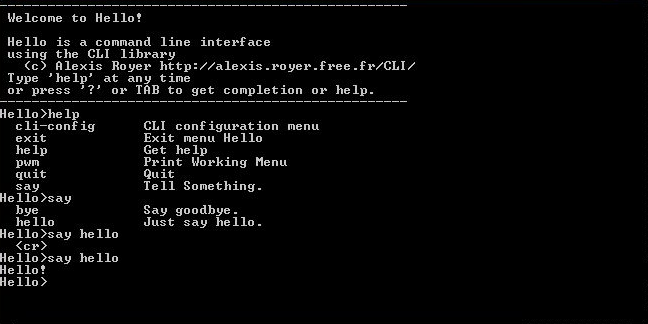 This 'Hello world' example shows the direct relationship between the XML resource file and the CLI execution of the user-defined function 'sayHello()' for instance. Edition facilities: The user can use left and right arrows, begin and end, delete and backspace keys for command line edition. History: The user can use up and down arrows to navigate through the command line history. Completion and help: The user has facilities to get into the set of commands. The CLI toolkit automatically manages completion, and help can be set for every keyword and parameter. XML resource file: All the command lines syntax can be described in an XML resource file, natively managing keywords, parameters, tags... This XML resource file provides the ability to directly insert the final native calls attached to each command, making the link with a global application. Automatic documentation generation: Based on the XML resource file, the CLI toolkit provides a stylesheet automatically generating CLI documentations. Generic input/output: Input/output can be easily redirected. The CLI toolkit currently gives support for the following regular input/output devices: console, telnet connections, files and strings. But you may implement your own intput/output device for your special needs. Traces: An inner traces management system is available with the toolkit. Integrate the result of the transformation. Please refer to the user guide for detailed instructions. Monitoring and debug: It is sometimes useful to have a secondary user interface, to monitor and debug an application. Configuration files: You can easily define a specific configuration file syntax with the CLI toolkit. Therefore, you could use it instead of .ini or XML files. Automation: Since CLI is text-based, it is compatible with automation. Automated test tools generally need to interact with tested equipments or softwares. The CLI toolkit is an easy way to implement an entry point on target equipments for unit tests. Simple compilers: The CLI toolkit can be used for its command line parsing ability, making by that way compilers of simple syntaxes. This open source software, written by Alexis Royer, is provided under BSD-like license. Bug(major)! cli2java.py: infinite generation for backward tag[@ref] within tag[@id/@hollow]. Bug(minor)! Crash in CmdLineEdition::GetNextWord()/GetPrevWord() (only used in tests). Bug(minor)! Left and right parts inversion in CmdLineEdition copy constructor (no impact on the final behaviour). Bug(minor)! French: spelling "Command[+e] incomplète"
Bug(minor)! Rejected! cli2java.xsl: bad generation for backward tag[@ref] within tag[@id/@hollow]. cli2help.xsl, deprecated in CLI 2.9, will remain unfixed. Please use cli2help.py instead. Description: New major improvements: execution contexts and faster python transformation tools. Bug(minor)! cli2help.xsl: Wrong default description for forward tag options. Bug(minor)! Rejected! cli2help.xsl: wrong number of options generated for (a|b)+ patterns while (a|b)* works fine. Description: Contributions, text edition facilities and many other improvements. Input/output devices infinite loops protection improvements with deprecation of GetActualDevice() and addition of WouldOutput()/WouldInput() methods. Description: Patch for CLI 2.5 bugs. Description: Schema, automatic documentation, 'members' and 'constructor' sections and 'prompt' handler additions. Plus other stuff. Description: Bug corrections & improvements. Licensing: URL link addition in the license. C++/Java: 'show version', 'show author' and 'show license' commands addition in the 'cli-config' menu. 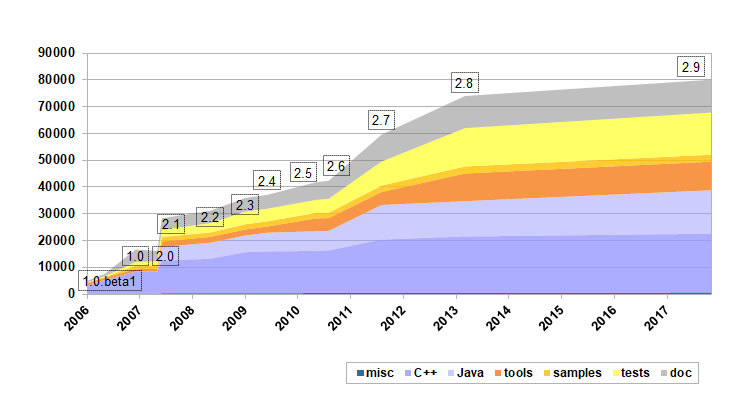 C++/Java: ALL_STREAMS management in Shell and IOMux. C++: stdout and stderr flushing addition for a better rendering. Description: Left and right arrows management. Clean screen management. Plus other stuff. Bug(major)! IOMux device closure error. Bug(major)! cli::tk::Queue::Iterator [tk_stl.h] definition revision. Incompatible with some compilers. Bug(major)! Java object consistency problems. Bug(major)! XSL generation errors for menus directly generated for an endl node. Bug(major)! Bad cppclic.xsl generation for 2 level menu structures. Bug(major)! Memory leak in Queue::~Queue() [tk_inner.h] -> m_arptQueue was not destroyed. Bug(major)! Consistency errors because of static constant objects in C++ files when compiled with Visual .NET. Singleton used instead. Bug(major)! Bad javaclic.xsl generation for 2 level menu structures. Test addition. Bug(minor)! InputFileDevice::GetKey(): unknown characters do not end the file anymore. Bug(minor)! Spelling error: "Uncomplete" changed to "Incomplete" in CommandLine::Parse(). Bug(minor)! System includes (#include <>) changed into project includes (#include ""). Bug(minor)! When an input file does not exist (cli::InputFileDevice), no error message is printed out. => Addition of a m_cliLastError member in cli::OutputDevice, that can be set by all subclasses. Bug(minor)! TAB when the line is empty does nothing. Doxygen documentation generated in web directory. Description: Java support and various improvements. License modification: The former LGPL license has been abandoned for a BSD-like license. This is the decision of the author (myself) in order to have fewer constraints on using and modifying the toolkit in any kind of softwares (even commercial ones), which is what I wanted initially. Description: Not a beta anymore! Improved again, and fully C++ coding now. Revision of cpp section naming in XSL. include/cli directory creation and file names modification. Bug(major)! No help display on completion so far. Bug(major)! Bad management of '%' and '|' characters. Bug(major)! Incorrect behavior on a string parameters filled with "" (completion and execution, as if not set). Bug(major)! Not possible to have two tags on the same syntax node. Bug(critical)! Crash on CcliOutputDevice::operator<<(const char* const) with NULL for parameter. Bug(major)! Scenario: prompt stream disabled, Echo enabled, TAB for help display => current line not printed again. Description: This version has been improved a lot, and tested on both Linux and Windows. Windows / cygwin support (Linux is still available of course). Escape characters and double quotes management. Beep support for IO devices. Welcome and prompt messages modification. Echo and beep on/off live configuration. User-defined includes generated in the very first place (useful for pre-compiled headers). '?' / TAB, help / completion behaviors improvement. CLI retrieval based on regular expressions. Bug(minor)! A new line is not printed anymore on unsuccessful tab request. Bug(minor)! The line is not printed anymore when a syntax error occurred. Bug(minor)! Elements sorted for help display. Bug(minor)! "Syntax error next to..." not correctly displayed on completion. Bug(minor)! Double definition of CcliElement::FindElements() fixed. Description: Very first release. I still propose it for download for history purpose only. Quite stable, but needs little adaptation to work under Windows for instance. Let's say it was ready for demonstration. Enum parameter: Implement an easier way to let the user enter predefined string values as a parameter, rather than using forward tags. Memory pools: Implement memory pools in order to provide better memory management with embedded integration contexts. Latest version of the CLI toolkit is 2.9. Please refer to history section for previous downloads. The CLI toolkit is also available for download on Sourceforge.